The highlight of this trip was the 16-hour flight on CX from JFK to HKG, CX’s home base, and a visit to the Pier, CX’s first-class lounge. After the less the impressive time in the BA lounges, I was anxious to get underway. 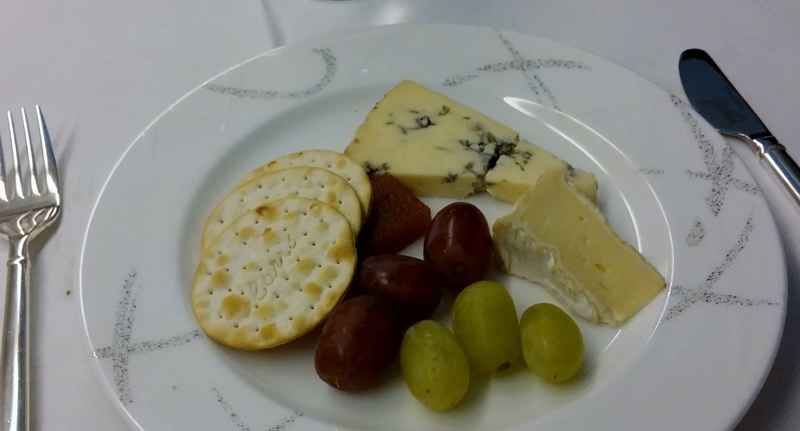 CLT to BKK Part 3 The Pier, CX First Class Lounge and HKG to BKK CX Business Class. I left the lounge when boarding was announced and had a short walk to the boarding gate. It was a pleasure to use the first-class boarding lane and separate jet bridge to the forward cabin. I showed my boarding pass to the flight attendant at the door of the CX 777. She smiled broadly and accompanied me to my seat, 1A. 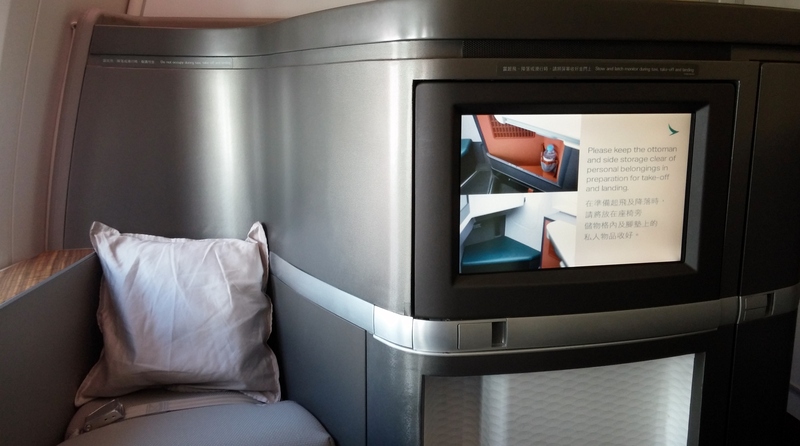 There are six first class seats on the CX 777-300 in two rows of a 1 x 1 x 1 arrangement. So each seat, of course, has direct aisle access but only the four seats on the outside have windows. I was duly impressed when I saw my seat. The seat is 36′ wide and 81′ long. I had a carry on and a back pack, which were my only luggage for this nearly three-week trip. I immediately displayed my ignorance by looking for an overhead bin to stow my carry on. Hah! No overhead bins in first. 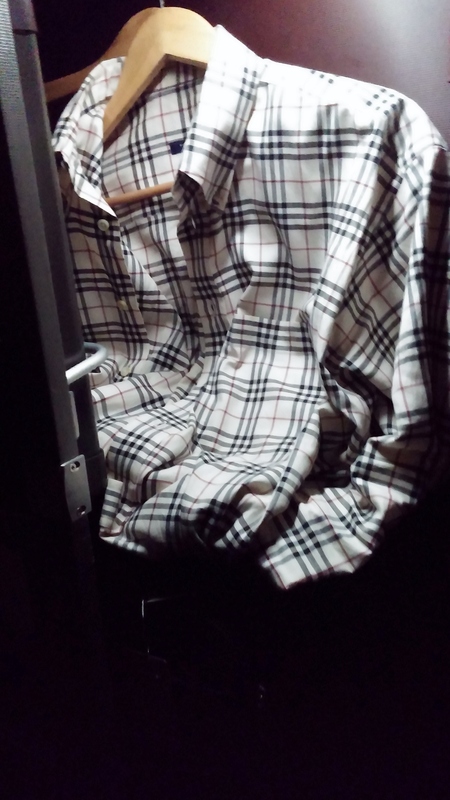 Each seat has its own closet. Duh! After the flight attendant (FA) showed me where to stow my bag, I began to explore the seat and the neat stuff that came with it. CX provides Bose noise-cancelling headphones, an Aesop amenity kit, and pajamas. The amenity kit had high-quality products. 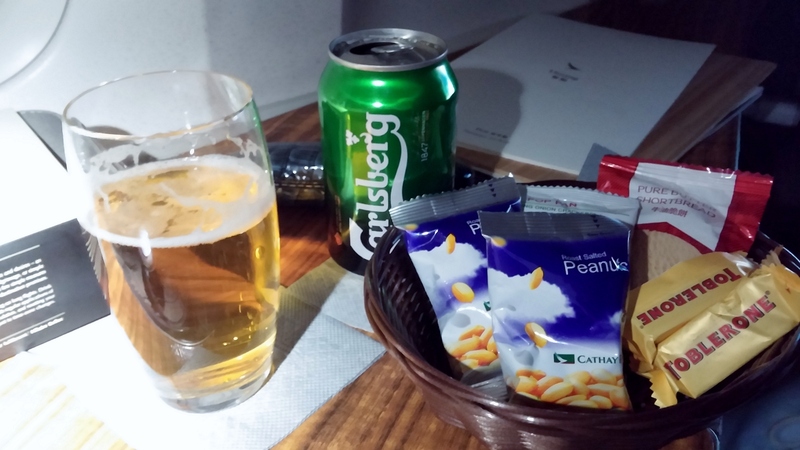 Everything needed to refresh during the flight and before landing. I’ve had many amenity kits before in business class although not as nice. This was the first time, though, that I had an airline provide pjs for a flight. Some bloggers who fly first all the time claim they change into their pjs even before the plane leaves the gate. I’m a little more modest, and decided to keep my clothes on, at least through the first meal service. 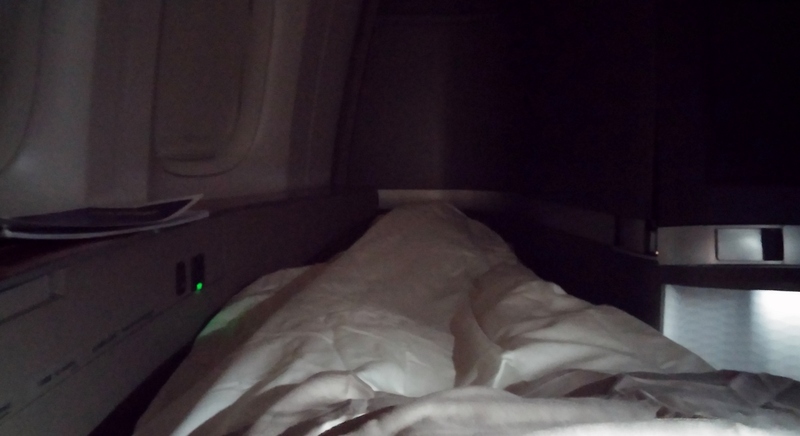 Besides first class isn’t supposed to be a slumber party with total strangers, IMO. The seat had a LCD touchscreen controller that was very easy to operate. There was a massage function as well as the obligatory full-flat feature and everything in between. 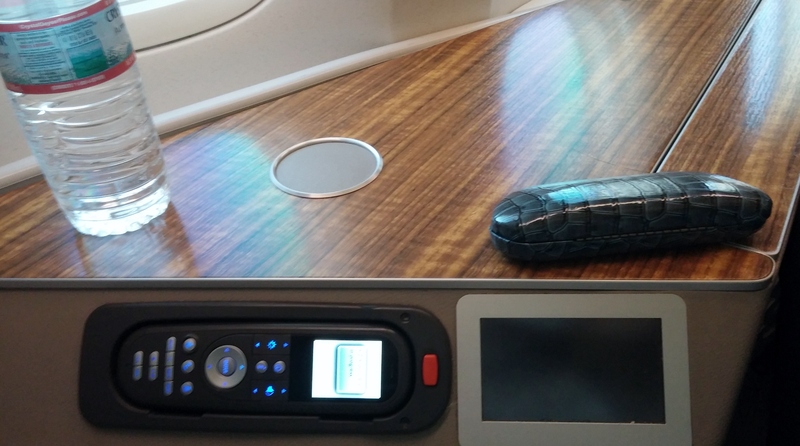 There was, of course, ac and usb power and some handy compartments for putting things like reading glasses, wallets etc. The video screen was huge. At least 21′ it appeared. Flight following offered several modes of display, or you could have it automatically rotate through the various modes. The video selections were extensive. Movies and TV shows from Hollywood and several other countries were available. While I was exploring my new environment, the FA came by with my pre-departure beverage, Krug champagne! It was accompanied by a delightful amuse bouche. This was only a taste of what was to come as we had not even left the gate. This flight was going to be fun. My mind and senses had yet to settle down as the pilots taxied to the active runway for departure. 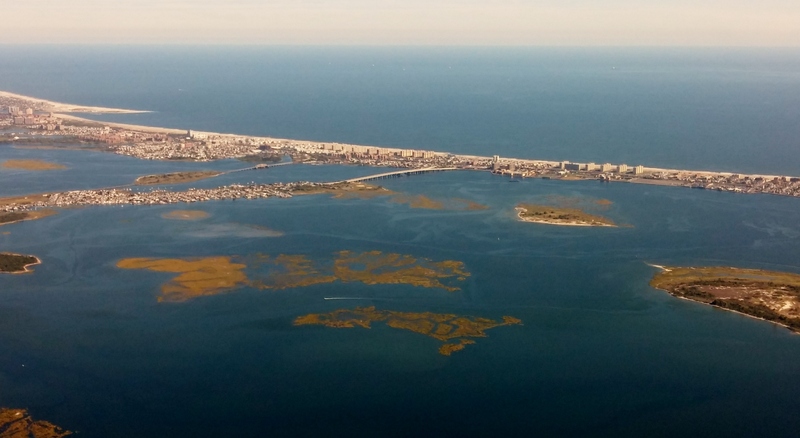 We departed runway 13R which put us on a southeast heading over Long Island Sound and then a left turn over the Atlantic. 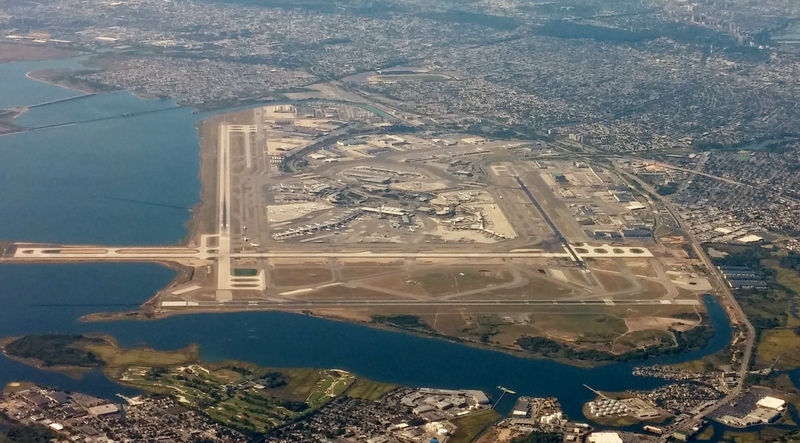 The left side of the 777 had a good view of JFK as we continued our climbing left turn to the north. The first meal service was lunch, although it was more in line with what I would call dinner. The service began about 45 minutes after takeoff. It started with caviar and Krug. 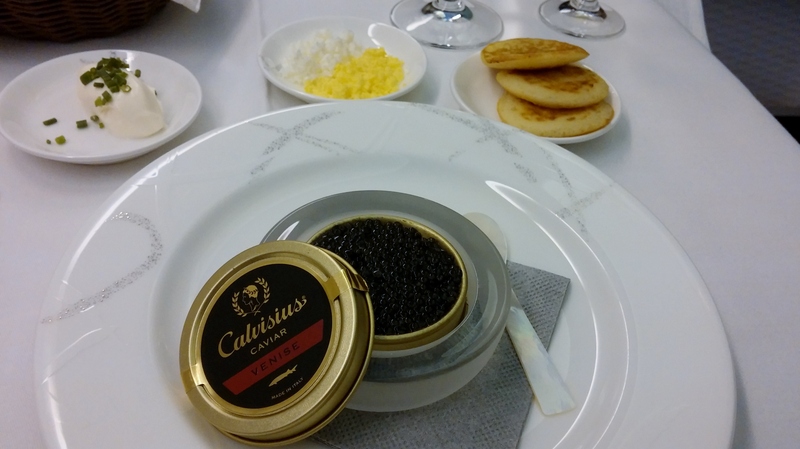 The caviar was served with garnishes of blinis, chive creme fraiche and chopped egg. 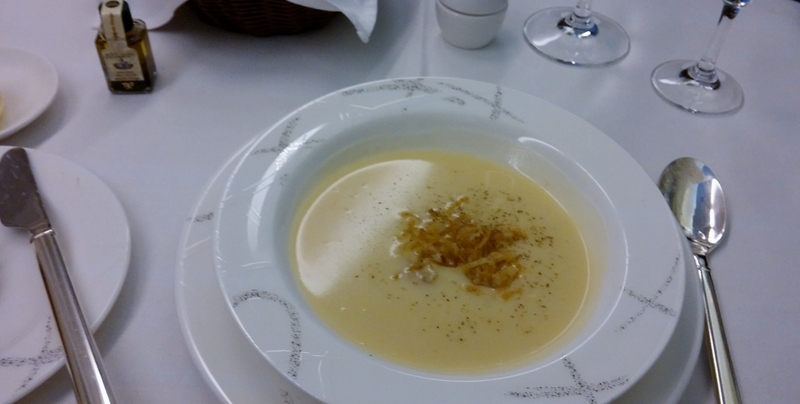 Next was a potato leek soup. 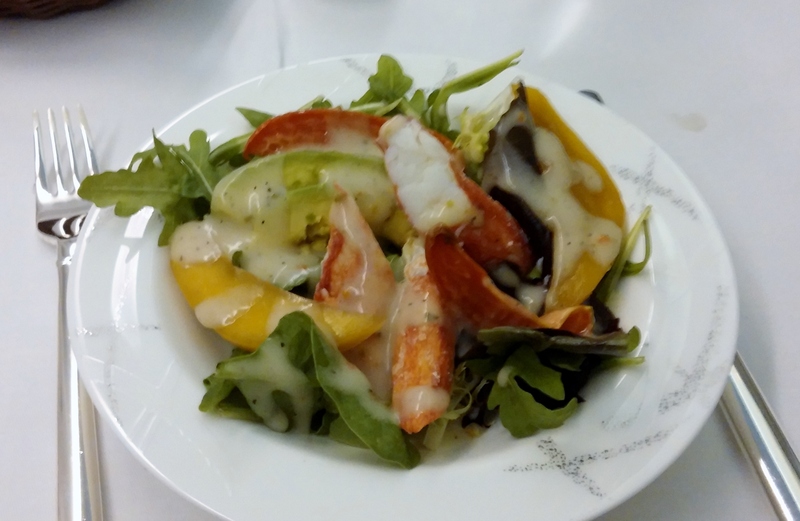 Followed by king crab, mango, avocado, and mesclun salad. The entree menu had three international and three Chinese options. I went with the Chilean sea bass. 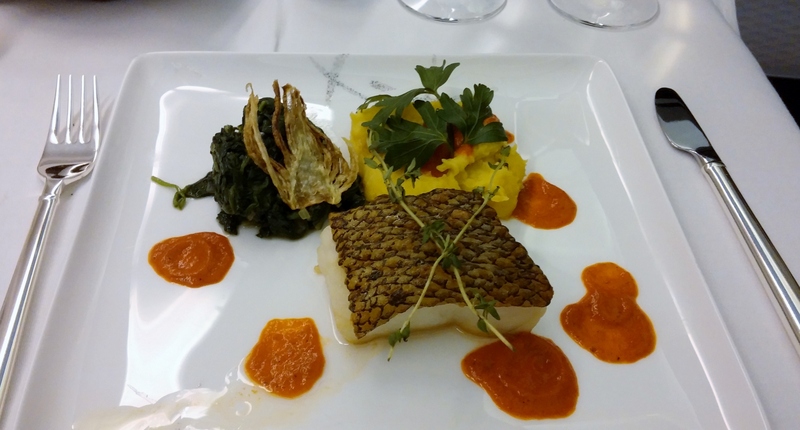 The bass was accompanied by saffron fennel mash, spinach, and gazpacho sauce. It was a wise choice. 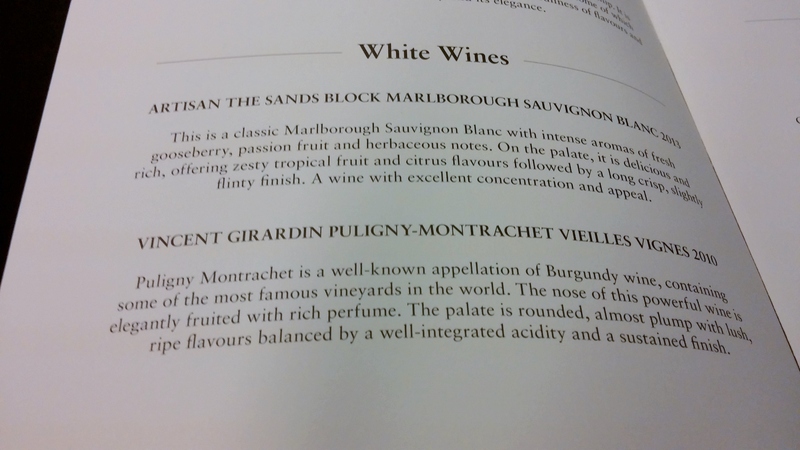 The FA recommended a wine. I don’t remember which one, but it was one of these. followed by blueberry bread pudding and ice cream. 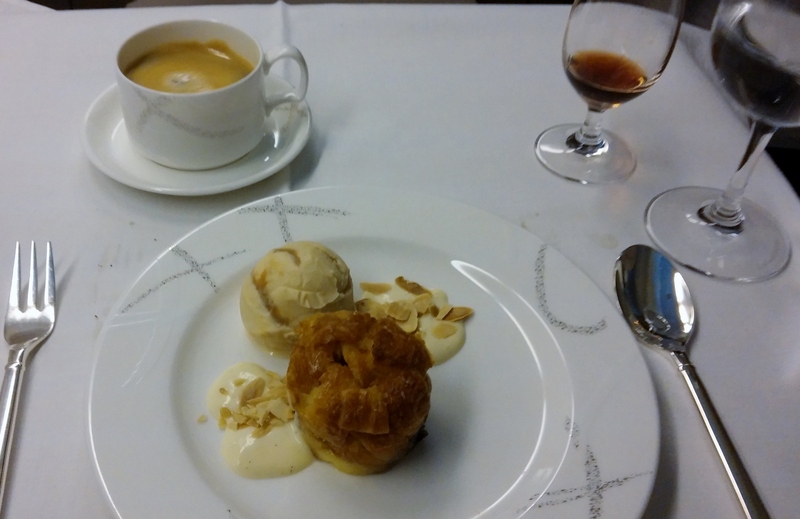 Dinner, rather lunch, ended with coffee and pralines. After that superb meal, I relined the 81-inch seat and watched a movie on the IFE. I also browsed through the CX in-flight magazine to learn more about its fleet, route network, and ff program and alliances. 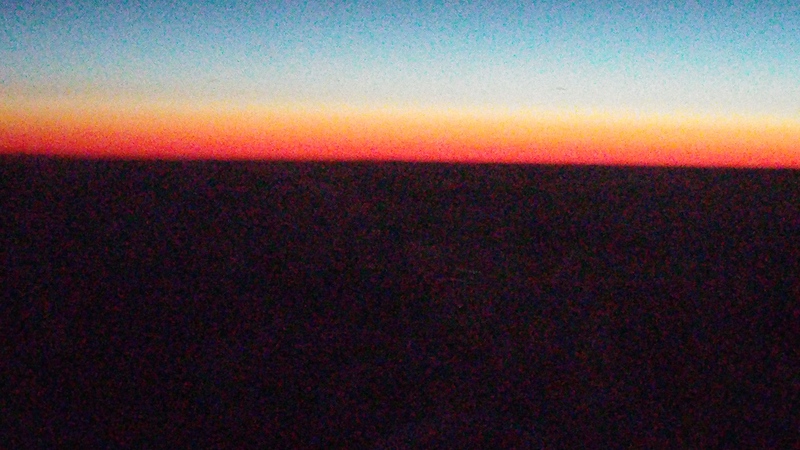 As we flew north over Greenland, I was treated to a stunning sunset. At this point, we still had over 11 hours of flying time. I decided to take a nap. I asked the FA to make my bed and told her I wanted to only sleep for a couple of hours. I wanted to be awake to enjoy as much of the flight as possible. I changed into the pajamas in the lavatory while the FA made the bed. There was plenty of room to change unlike in economy and even most business-class bathrooms. I hung my clothes in the closet. Time for a brief but refreshing nap. 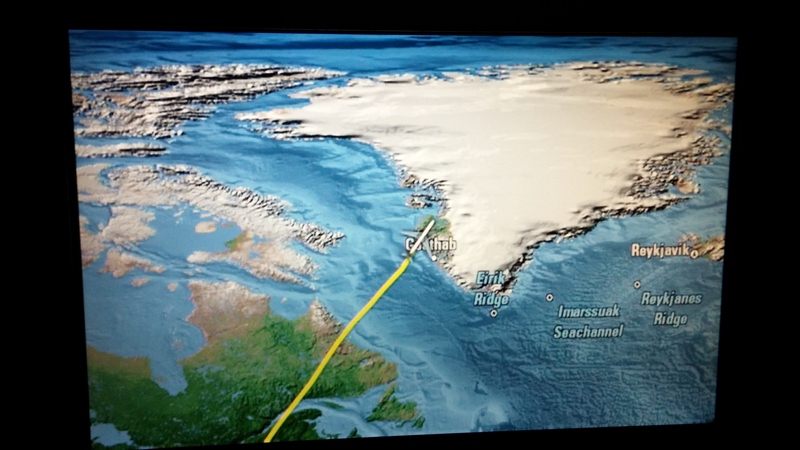 Later I ordered more Krug and watched some of the videos as our flight passed over the north pole and down over Russia, Manchuria and China. 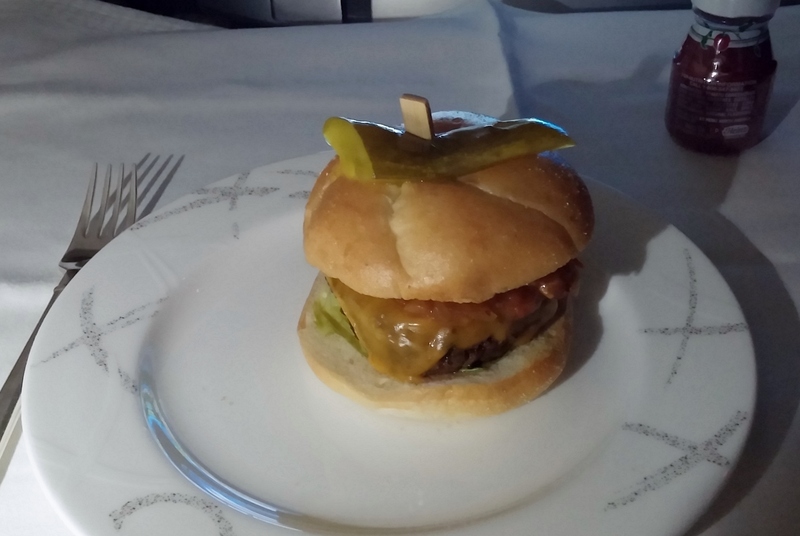 About two hours before landing, the FAs began the pre-arrival meal service. I had the chicken supreme with grilled vegetables, pappardelle, and lemon parsley jus. It was very good although not as elaborate a service as the first meal. A little more Krug took care of any disappointment I was feeling. At least the pre-arrival meal was not eggs. Soon the FAs instucted us to prepare the cabin for landing. The approach to HKG, which is located on Lantau Island, brought us over Hong Kong Island and Victoria Peak. We had good views of Hong Kong and Victoria Harbor from the left side of the 777. Regrettably the first part of this adventure was over. It spoiled me. 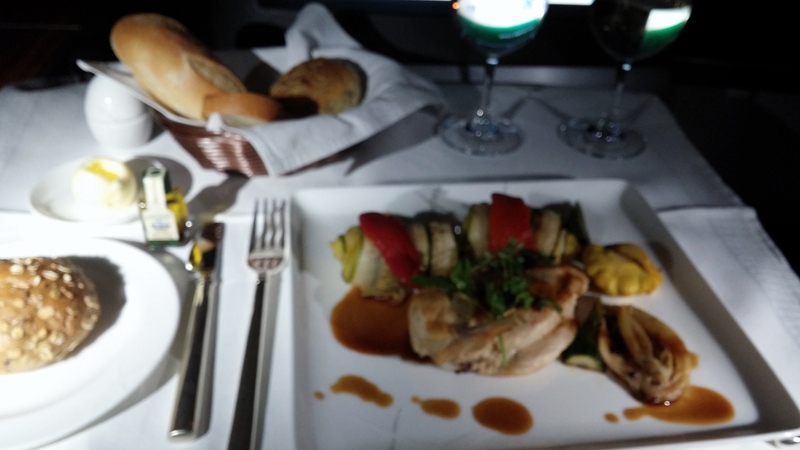 From now on, when I fly economy or even business class, it will be impossible to keep from comparing to the personal service, comfort, and quality of flying first class. The amazing thing is that it only required 67,500 AA miles for the one-way trip from CLT to BKK. That is less than the 75,000 AA miles I received as a bonus for signing up for the AA Executive World Elite MasterCard and meeting the spend requirement. Flying first class is great. Flying first class for free is stealing. Love it! While I rued the end of this flight, I looked forward to checking out the Pier, one of two CX first-class lounges at HKG. That is covered in Part 3. 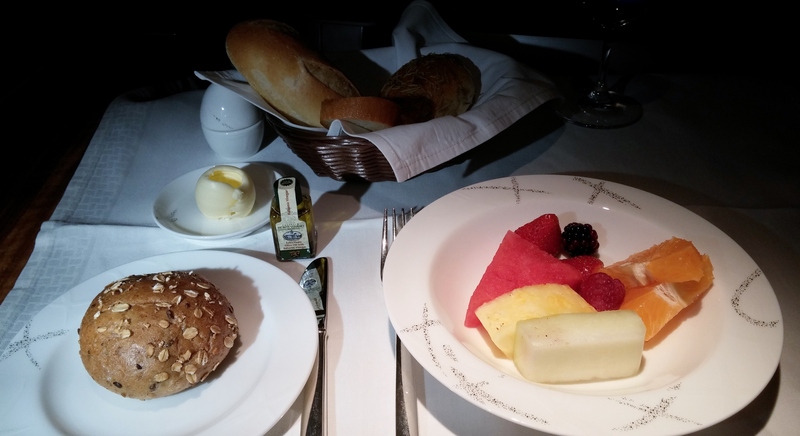 Next Next post: Charlotte, NC (CLT) to Bangkok, Thailand (BKK) Part 3, The Pier, Cathay Pacific First Class Lounge and Hong Kong (HKG) to BKK Cathay Pacific A330-300 Business Class.